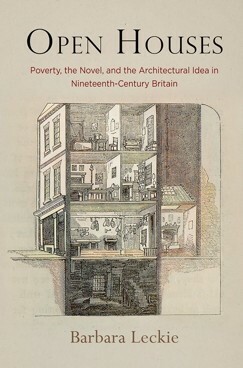 Prof. Barbara Leckie is the author of the recently published Open Houses: Poverty, the Novel, and the Architectural Idea in Nineteenth-Century Britain (University of Pennsylvania Press). In the 1830s and ’40s, a new preoccupation with the housing of the poor emerged in British print and visual culture. In response to cholera outbreaks, political unrest, and government initiatives, commentators evinced a keen desire to document housing conditions and agitate for housing reform. Consistently and strikingly, these efforts focused on opening the domestic interiors of the poor to public view. In Open Houses, Barbara Leckie addresses the massive body of print materials dedicated to convincing the reader of the wretchedness, unworthiness, and antipoetic quality of the living conditions of the poor and, accordingly, the urgent need for architectural reform. Putting these exposés into dialogue with the Victorian novel and the architectural idea (the manipulation of architecture and the built environment to produce certain effects), she illustrates the ways in which “looking into” the house animated new models for social critique and fictional form. As housing conditions failed to improve despite the ubiquity of these documentary and fictional exposés, commentators became increasingly skeptical about the capacity of print to generate change. Focusing on Bleak House, Middlemarch, and The Princess Casamassima, Leckie argues that writers offered a persuasive counterargument for the novel’s intervention in social debates. Open Houses returns the architectural idea to the central position it occupied in nineteenth-century England and reconfigures how we understand innovations in the genre of the novel, the agitation for social reform, and the contours of nineteenth-century modernity. You can consult the table of contents and read more about the book here.